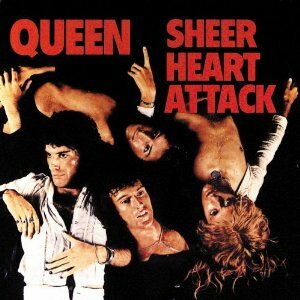 Queen’s third album, Sheer Heart Attack, saw the band finally hit mainstream popularity with the release of “Killer Queen.” With fairground sounds opening into the blistering super high Freddie Mercury vocals on “Brighton Rock,” a tune best known for its multiple lengthy echo guitar solos, we are then hit with the trio of “Tenement Funster,” drummer Roger Taylor’s offering, on which he sings as well. Then comes “Flick of the Wrist” where Freddie Mercury manages those infamous octave vocals on this rather dark tune. Later on is “Lily of the Valley,” which features a lilting piano-led vocal exercise overlap from Mercury. The band’s second single from this album, “Now I’m Here,” relies on lots of neat vocal delays and an opening single note menace from guitarist Brian May. The next tune is what Freddie Mercury called a prelude to “Bohemian Rhapsody,” which he built in three parts–piano arpeggios and high tone screams by Taylor, a middle section with a slowed down Freddie Mercury vocal, and then vocal harmonies built up and around the line “leave it in the lap of the gods.” “In The Lap of the Gods” is pretty much classic Queen. The more straight-ahead, speedy “Stone Cold Crazy” follows “Misfire,” which is John Deacon’s first composition. Seeing the Queen bassist playing almost all guitars (lead as well) on a poppy number and American tunesmith Jim Croce, who died a year before the Mercury penned “Bring Back That Leroy Brown” was recorded, gets a nice wacky 1920’s-like tribute/nod.